“Bring on the Heat” with this perfect blend of corn meal, flour, and spices! Enriched Bleached Flour (Wheat Flour, Malted Barley Flour, Niacin, Reduced Iron, Thiamine Mononitrate, Riboflavin, Folic Acid), Yellow Corn Flour, Salt, Yellow Corn Meal, Corn Starch, Spices and Coloring, Dextrose, Natural Flavors, Monosodium Glutamate, Dried Garlic. 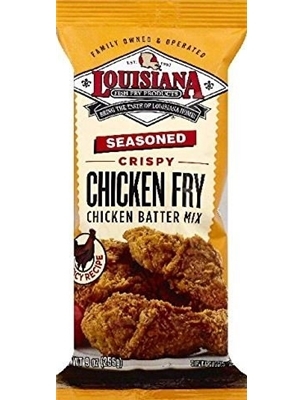 My girlfriend used this Chicjen fry and I hate to say it but it was better then my mothers.